One in 13 children has a food allergy. That's about 5.9 million children. So chances are you have or know someone who has a child with a food allergy. The best way to support them is by helping everyone understand food allergies better. Each year, the Asthma and Allergy Foundation of America (AAFA) declares May to be National Asthma and Allergy Awareness Month. The week of May 13-19 is Food Allergy Awareness Week. It's a perfect time to educate your family, friends, co-workers and others about these diseases. Order by April 18 to ensure you will receive your Awareness gear in time. Your purchase helps us continue our mission to improve the quality of life for those affected by asthma, allergies and food allergies. Raise awareness about food allergies with a Food Allergy Warrior T-shirt and a silicone #KEEPITTEAL food allergy awareness bracelet. These are a great way to start conversations with others about food allergies. It’s important to carry your emergency asthma and allergy medicines everywhere you go. We offer medicine bags in different sizes to help you remember to take them with you. Each bag is made of neoprene and has a zippered closure to keep your medicine secure. Help others understand what it means to have a food allergies and how to help keep your child safe. Share some of KFA's educational information and activity books. These are all available as free downloadable PDFs. Some are available as printed books for a small cost. Was your child recently diagnosed with food allergies? 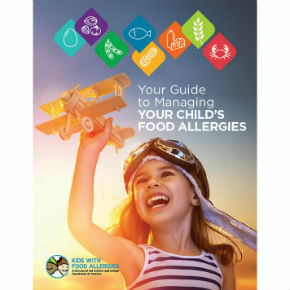 Or would you like to others in your child's life to know more about managing food allergies and what it takes to keep them safe? Share our free guide. This coloring and activity book gives children and families a basic understanding of asthma and food allergies. It is a fun way for children to learn common asthma triggers. It also helps them learn how to manage their asthma and food allergies. It has word finds, crossword puzzles, word scrambles, mazes and other activities. It also has a story to read and color and a list of websites on asthma and allergies for parents and kids. 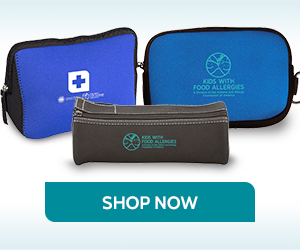 When you purchase gifts from our online store, the proceeds help us continue to work to educate, advocate and support research that will allow those with asthma and allergies to have better health and quality of life. There is no cure for food allergies, but KFA provides the practical support that gets families through each day.